We have conducted a permanent pricing reduction on all VSS published books (print & digital versions). 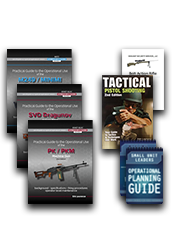 This covers the “Practical User Guide” weapons manuals and the “Handbooks“. For the month of February, we are running a 10% off sale on all VSS published books (print & digital versions). Take advantage of this sale on top of the price reduction for great savings.